Plenty of sunshine, beautiful high desert scenery, and excellent fishing make Lake Simtustus a popular destination less than an hour’s drive from Bend. Located less than an hour north of Bend just outside of Madras. The lake has a variety of fish including trout, bass, and Kokanee salmon. Separated from Lake Billy Chinook by the Round Butte Dam. Several campgrounds in the area provide ample sites. Lake Simtustus Oregon is located north of Bend in Central Oregon’s scenic high desert country. Surrounded by steep basalt canyon walls, this scenic lake is quite narrow, with widths of 300 feet to almost 1000 feet. Sagebrush and juniper dot the countryside around the waters of this cold, deep lake. 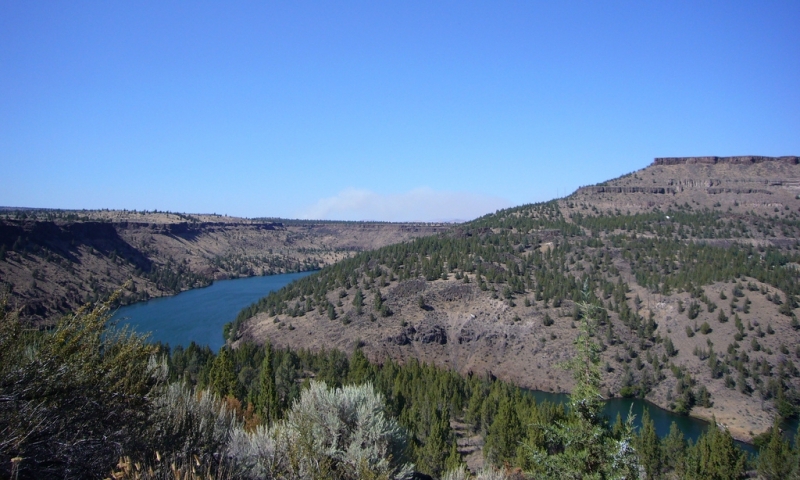 Lake Simtustus is separated from nearby Lake Billy Chinook by the Round Butte Dam. With more than 300 days of sunshine each year, locals and visitors come to this lake year round for excellent fishing, camping, and other outdoor activities. Lake Simtustus is located approximately 45 miles north of Bend just outside of Madras. Fishing – Lake Simtustus is a popular fishing spot for enthusiastic anglers. Abundant in wild Kokanee salmon, the lake also has smallmouth bass and a variety of trout residing in its waters. Camping – Bring your tent and camp out under beautiful Central Oregon stars at one of three campgrounds near the lake – Lake Simtustus Campground, Indian Park Campground, and Pelton Park Campground. There are also several other campgrounds in the area including those at beautiful Cove Palisades State Park, just southwest of the lake. Lake Simtustus has 637 surface acres of water. The deepest part of the lake reaches 155 feet. The lake’s elevation is 1,580 feet. Lake Simtustus was named after an Indian warrior who served with the U.S. army back in the mid-1800s. The warrior died on the Warm Springs Reservation in 1926 where he lived for many years.